"Ordinary electronics are in the range of gigahertz, one billion operations per second. This method is a million times faster," said Mackillo Kira, U-M professor of electrical engineering and computer science. Quantum computing could solve problems that take too long on conventional computers, advancing areas such as artificial intelligence, weather forecasting and drug design. Quantum computers get their power from the way that their quantum-mechanical bits, or qubits, aren't merely 1s or 0s, but they can be mixtures— known as superpositions—of these states. "In a classical computer, each bit configuration must be stored and processed one by one while a set of qubits can ideally store and process all configurations with one run," Kira said. 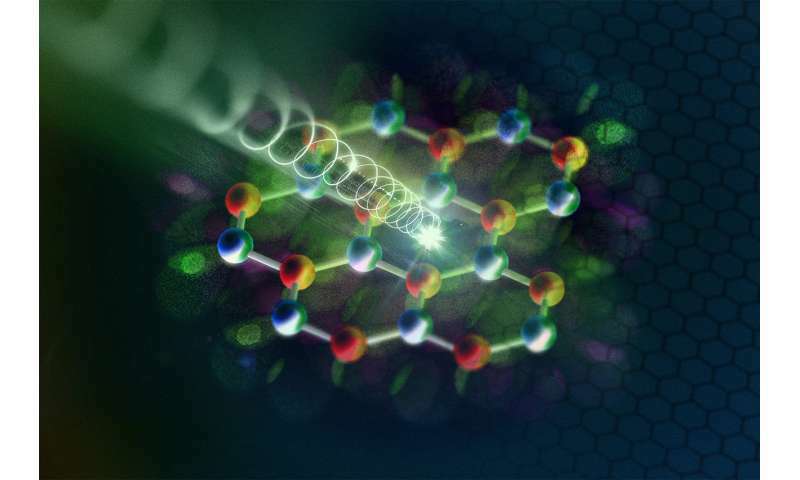 "In the long run, we see a realistic chance of introducing quantum information devices that perform operations faster than a single oscillation of a lightwave," said Rupert Huber, professor of physics at the University of Regensburg, who led the experiment. "The material is relatively easy to make, it works in room temperature air, and at just a few atoms thick, it is maximally compact." The material is a single layer of tungsten and selenium in a honeycomb lattice. This structure produces a pair of electron states known as pseudospins. It's not the spin of the electron (and even then, physicists caution that electrons are not actually spinning), but it is a sort of angular momentum. These two pseudospins can encode the 1 and 0. Huber's team prodded electrons into these states with quick pulses of infrared light, lasting just a few femtoseconds (quintillionths of a second). The initial pulse has its own spin, known as circular polarization, that sends electrons into one pseudospin state. Then, pulses of light that don't have a spin (linearly polarized) can push the electrons from one pseudospin to the other—and back again. By treating these states as ordinary 1 and 0, it could be possible to create a new kind of "lightwave" computer with the million-times-faster clock speeds that Kira mentioned. The first challenge along this route will be to use a train of laser pulses to "flip" the pseudospins at will. But the electrons can also form superposition states between the two pseudospins. With a series of pulses, it should be possible to carry out calculations until the electrons fall out of their coherent state. The team showed that they could flip a qubit quickly enough to execute a string of operations—basically, it's fast enough to work in a quantum processor. You mean like "Photon Induced Electric Field Poling ?, like the patents granted many 18 years ago ? Like Quantum Holographic Optical Data Storage that is non-volatile, has spintronics capability, has quantum communications capability, etc. Really, and can you teach a 50 year pioneer of many technologies he already know's about ? Does that mean after 15 years anyone can steal personal IP property ? I guess fusion research with $ 100's of billions and 50 years, if also me too technology ? 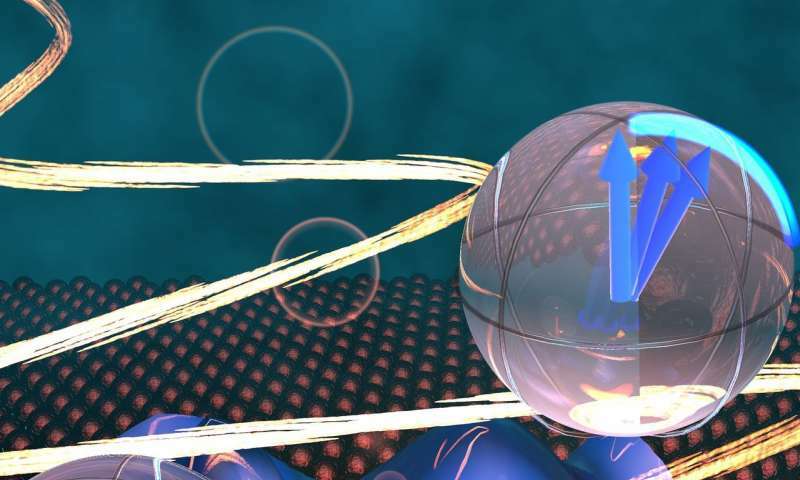 Manipulating electrons at absolute zero prodding them with laser light your restricted in the reactions of the electron which does not physically move at the speed of light plus the fact computers at absolute zero won't make much headway in the commercial world of computers, tablets and mobile phones attached to a cryogenic device. As these computers have to operate at room temperature to have practical applications I can't see the point of carrying out these experiments at absolute zero now the proof of concept has been proved. But it's still not possible to square the photon and electrons reaction time where in the final interface with the human operator all these photonic signals are converted to conventional circuits with their processors to realise their calculations in the macro world as we input the data where conventional circuits slows the possible advantages to a snail's pace.